This weekend Lehigh’s Brown/White Spring game will be happening at 11:00 AM at Murray Goodman Stadium. Admission is free and it will be Lehigh Nation’s first view of what the 2019 Lehigh Mountain Hawk football team will look like. This spring season has been unusual by Lehigh standards where there have generally been public releases as to how people are doing in regards to moving up and down the depth chart. With the hiring of new head coach Tom Gilmore, this spring seems to be more about establishing “Gilmore fundamentals” as well as assessing the overall situation. I’ve come up with a list of fifteen possible names, some which I’ve heard whispered as candidates, others which might be good fits at Lehigh for a variety of reasons. 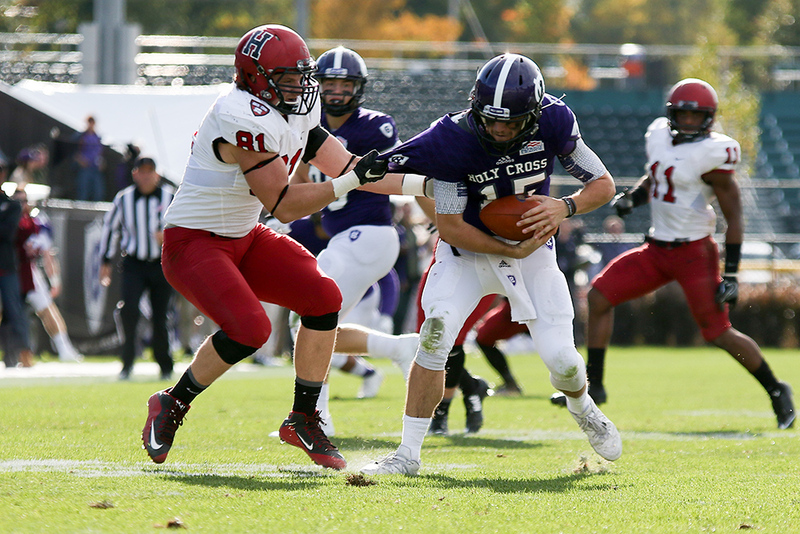 It was clear that Holy Cross’ 32-0 loss to Yale wasn’t going to yield many highlights for their end-of-the-year DVD. At 2-5, the Crusaders did, and still do, have a chance to win the Patriot League, if they win the rest of their games and Lafayette loses twice – certainly not an inconceivable notion. Even so, Holy Cross athletic director Nathan Pine sent shockwaves through the Patriot League this weekend when he called head coach Tom Gilmore and told him that he was being terminated immediately, with Brian Rock, the team’s offensive coordinator and quarterbacks coach, taking over in an interim basis. The fall of this Holy Cross team and the circumstances that led to Gilmore’s firing was stunning. It was a day where even when things went wrong they went right for the Mountain Hawks. It was early in the second quarter, deadlocked at 7. Sophomore QB Brad Mayes, picked the starter as senior QB Nick Shanfisky would be the backup to let his injured leg continue to heal, would get a drive going with an 18 yard pass to junior WR Troy Pelletier. Two plays later, sophomore RB Dominick Bragalone would run a counter play left, escape a few tackles, and surge for a 28 yard run into Holy Cross territory. You could feel some momentum building as Mayes would connect on a 4th and 7 to Pelletier to get into the Holy Cross red zone, and again when he would rifle a ball to junior WR Gatlin Casey over the middle. There was even more when sophomore RB Micco Brisker would keep his legs moving – and his offensive line, pushing – until he reached the end zone. Up 13-7, on the extra point Shafnisky, who holds during extra points, got a low snap, and scrolled right. Looking up, he saw junior DE Tyler Cavenas, wide open in the end zone, waving his hands. To salvage the free shot at points, he lofted the ball to Tyler – and he came down with the ball. It ended up a very good day for the Mountain Hawks, where positive thing after positive thing kept happening for the Mountain Hawks, some planned, some unplanned. Despite a game where weather seemed like it might make for a tough go, Lehigh wasn’t slowed down at all in their 46-14 win. It’s often said that preseason publications aren’t worth the paper they’re printed on, and almost unusable when the actual regular-season matchup comes around. And in the case of Holy Cross, that’s especially apt. 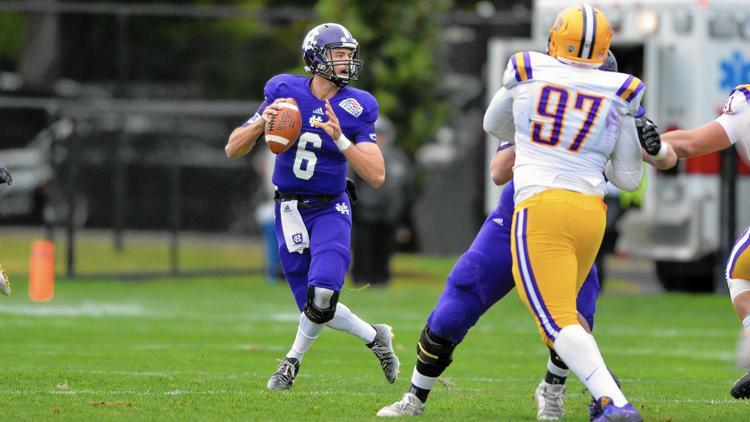 Much of the hype around the Crusaders centered around their star QB, unofficially anointed the best quarterback in the Patriot League, senior QB Peter Pujals. Much of my writings about Holy Cross centered around what he can do, what he brings to the table, and what his weapons are. But a left ankle injury in the first half of the Dartmouth game didn’t just sideline him for that contest – it sidelined him for the season, forcing his ankle in a boot and will almost certainly have him apply for a medical redshirt for next season – unless head coach Tom Gilmore decides, against the odds, to have Pujals play this weekend if he’s healed up enough. That and a slew of other injuries pretty much wrecked anything I wrote before this past August about breaking down this Holy Cross offense. However it also, in a way, makes Holy Cross more dangerous. They won’t be facing off against the regular cast of characters. Alabama, Arkansas, Texas, Florida. South Carolina, Louisiana, Tennessee, Georgia. No, this isn’t a list of Power 5 opponents that are suddenly going to be hosting Lehigh and Holy Cross in football the next few years. It’s a list of just a few of the many states across the country that will be carrying the TV broadcast of the Lehigh/Holy Cross clash. It’s going to be airing on something called the American Sports Network, which isn’t a network in the broadcast sense but more of a network in the Internet sense: a network of interconnected stations, some over-the-air broadcasts, some local cable stations, that will be carrying Lehigh football over their airwaves. If you live in PA, all you need to know is the game is going to air on CSN-Philly, CSN-MidAtlantic+, WHP-2 Harrisburg, WPNT-2 Pittsburgh, or WSWB-2 Wilkes-Barre. If you live somewhere else in the lower 48 states, a full list of broadcast outlets can be found here. It adds to the tension of what is already a big game this weekend. Today’s “Know Your 2016 Opponents” series continues with the team that is predicted by College Sports Journal to finish 3th in the Patriot League: Holy Cross. Scared of the Purple People eaters this year? I am. They’re a veteran-laden offense, with a four year letterman at quarterback, hosting Lehigh this year at their home in “Woostah”. Defensively, conventional football scholarships have the Crusaders with a quickly built defense that got better as the season went along. They’re a team that hasn’t made the jump – yet – but could, playing Lehigh at home, poach the Mountain Hawks. It’s a game I have circled on the calendar.